Today I went for a bike ride up to the top of the Pass and then a short run up the Otira valley to the bridge. It was only 4o mins of exercise, but I am sick of sitting around feeling sorry for myself with this flu. 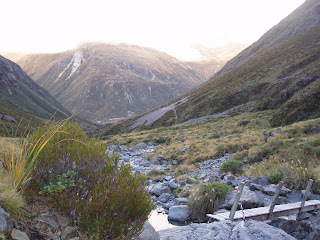 Here is a photo of the Otira Valley from the Bridge. It was cold today and we had some snow on the tops.I felt better after a bit of exercise and a session of yoga! The Christchurch SBS marathon is only a week away! I'm hoping to be free of the cold for the starting line!